Kansas is the favorite until someone actually beats them. You're such a homer. Carter was the best defensively player in the conference if not the country last year. No way you come close to replacing his toughness, play making, and leadership. WVU had their cahnce to take KU down last year and you all choked. No way y'all are even close to as good of a team next year as you were this year. You should look at who wvu brought in. Huggins said he wouldnt trade his front court with any team in the country. Knapper redshirted last year, and he's better than carter. wait and see. MCCabe toured with the harlem globetrotters when he was 12 and made half court shots routinely in front of huge crowds. He's one top pgs in the country and can handle a basketball like Pistol pete. Mccabe also brought his aau buddies with him. WVU will be the team to beat in the big 12, ans huggins is the 1st to say if he doesnt have anything. he truly believes he can win it all with this team. Teddy allen would start for almost anyone else and he had to be booted to make room for a better player. Same with another big man who saw a ton of minutes. Knapper will not be better than Carter, you're delusional. McCabe is a good player, I've seen him in person. But he'll lack strength in conference. In a year or two he could be a force, but not next year. Teddy Allem didn't get booted, he thought he was better than he was and was a head case, like a ton of Huggins typical thug type recruit. Like it or not, OU has bolted the conference football trophy to their trophy case, Kansas has the basketball trophy and OSU has the wrestling trophy. Without doing any homework, I'm sticking with those 3 until proven otherwise. ESPN has finalized their top-100 rankings for the 2018 men’s basketball recruiting cycle and a pair of West Virginia Mountaineers recruits can be found on the list. Men’s basketball recruiting can be much finickier than football. With the varying amount of scholarship year-to-year, some schools will take 3 players, some will take four and others may only take 2. This can certainly affect average rankings in a far greater capacity than the standard 25 scholarships that are given out annually by football coaches. 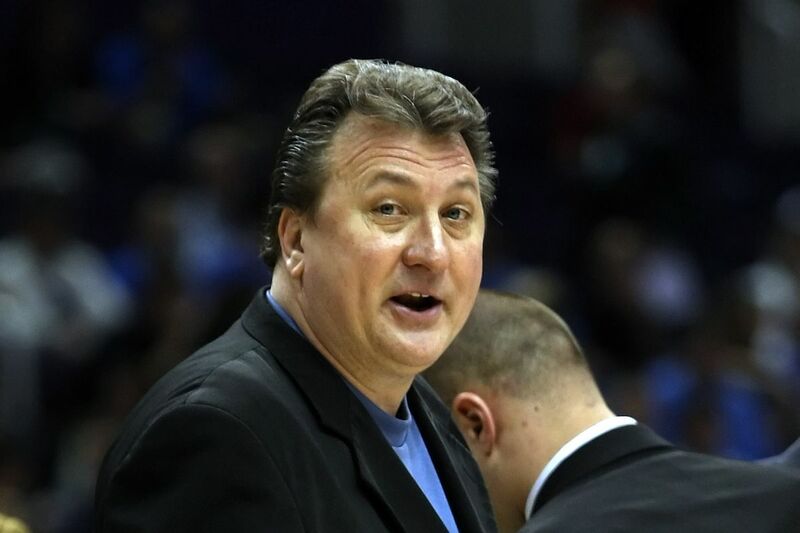 For Huggins, this recruiting cycle saw him convince three players to join the Mountaineers. We’ve already featured two on the website, Jordan McCabe and Trey Doomes but the highest recruit, Derek Culver, hasn’t gotten much press. Until now. With the release of the ESPN rankings, fans, players and analyst will certainly take notice. According to 247Sports, Culver is the highest rated recruit to join the Mountaineers since Esa Ahmad. Culver had offers from around the country, including Big 12 powerhouse Kansas Jayhawks. As a big man, Culver displays an array of talent including the ability to move his feet and keep smaller, quicker forwards in front of him while displaying a mid-range jumper. Culver doesn’t look to jam it home when he’s in the paint, either. He keeps his head up and has shown the ability to move the ball around the arc, finding open teammates instead of attempting a contested rim shot. Jordan McCabe should be no stranger to fans by now. With several videos on youtube displaying his ball-handling prowess, fans have been excited to see McCabe in a Mountaineer uniform. We got the first taste of the what McCabe could do this past weekend when he and future teammate Trey Doomes teamed up to win the 3-point and slam dunk contest, as well as taking home co-MVP in the Scott Brown Classic. McCabe’s ball handling skills will hopefully help alleviate the loss of star forward Jevon Carter. wvu also signed the number 1 rated and no 5 rated jucos in the country, as well as adding mathews(a clear upgrade over teddy allen). anyway im just saying wvu may be flying under the radar and be a good bet to make cash. Beat Kansas and then you have a point. Until then you are wishing. Well, whether you do or not, I'd like to see someone else besides Kansas win the damn thing, so best of luck. I’m sick of an OSU board being hijacked by this guy. This garbage belongs in B&F. Meh, he adds a little depth to the echo chamber. It's going to be a slow summer. Insert funny "I'll allow it" meme. Sounds like too much work for me. It doesn't matter who WVU brought in, Kansas is better until someone else proves they can beat them. And last year you were telling us Esa Ahmad was a lottery pick and when he came back y'all would win it all. Y'all have talent, I'm not arguing that, the problem I have is with you saying people will instantly be better than Carter and Miles, those two were literally your best back court duo ever. Same with Teddy Allen, he was rated just as highly as the people you're telling us about now. And Allen actually produced pretty good for his role. Now you've written Allem off and are saying the latest is the greatest. You're the classic troll who always thinks the backup is better than the starter. And you'll be saying the same crap next year. I appreciate everyone who comes here from other fanbases because it gives me insight to their programs. (With the exceptions of a few OU fans.) Besides, we're in the black hole of sports where there isn't anything to watch except baseball, and I stopped caring about baseball when we got knocked out of the regional. I'll always pick KU to win the league until someone dethrones them. It seems like every two or three years Kansas loses a lot of talent and we're predicting that another team will win the league. But they reload every time and find a way to pull it out. WV looks like they have the most talented roster this year, but KU has the 5th ranked recruiting class coming in and they have some good pieces coming back. It should be another really fun year to watch Big 12 basketball. I don't think WV has much of a chance to win the NC for two reasons. First off, it's rare for a team to win a NC without having an NBA level point guard to run the show. Second, I don't know that Huggin's system is conducive to winning a NC. I love to watch the chaos his system creates, but a good team with an NBA level backcourt can beat it and WV's half court offense is nothing special without creating turnovers. I don't much like that we divide the board up into so many forums anyway. It buries things like the Joltin Joe story or the Baylor sexual assault stuff, to a forum that gets unnoticed. Although I understand the need to find a place to dump those from another school down south who take the time to come here, sign up, and tell us how obsessed we are with them (irony). I find myself going to a TCU or UT board to learn the latest on many Big 12 related news items. Due to our fan base size it's already not a very active board. Then you divide it into the AV and um "others", next thing you know it's the same dozen posters rehashing the same debates. No kidding, it's summer guys. At least someone is posting topics for discussion.